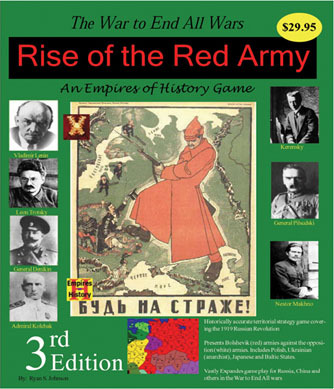 The Rise of the Red Army is a strategy board game covering the Russian Revolution following the end of the World War I. It is an easy to learn Axis & Allies variant style game, yet represents the conflict in Russia with historical accuracy. 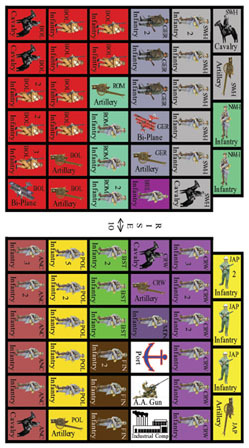 For 2-6 players, the Rise of the Red Army primarily represents the Bolshevik (Reds) conflict with the Crimean and Siberian (White) Russian opposition forces. In the middle of this conflict you have a number of "wild cards". Such as the Ukrainian Anarachist movement which fought against both the "Reds" and the "Whites". Such as the nations of Finland, Poland, and the Baltic states first fighting for self liberation, then territorial acquisitions against the various Russian factions. Toss in a Japanese occupation of the far east and western support of the Crimean, Siberian, and Northern White Factions, and you have multi dimensional conflict unlike any other in history.